Can You Die From an Inhalant Overdose? Can You Overdose on Inhalants? Inhalants include any drug that produces volatile vapors that are inhaled by the user. They include common household articles, such as paint, glue, felt-tip pins, and aerosol sprays. Who Answers? to learn about recovery options. Don’t leave someone alone who may be experiencing inhalant toxicity. Death can occur if the person engages in dangerous or risky behavior while under the influence. If possible, inform emergency medical personnel of the type of inhalant used, when it was used, and whether you or your loved one use any prescription drugs or have a medical condition. The sooner you get help for an overdose, the better. Administering medications such as anti-arrhythmic or beta-blockers to stabilize the heart. Who Answers? to speak to a treatment support representative about programs to help you or your loved one recover from an inhalant overdose or addiction. Heart, lung, liver, and kidney damage. Not everyone has the same reaction to inhalants. It is possible to survive an inhalant overdose and overcome an addiction to inhalants. Many people who use inhalants have a substance abuse problem – even if they say they only use once in a while. Seeking professional treatment is one of the most helpful ways of recovering from an inhalant overdose, preventing another overdose, and reducing the likelihood of some of the long-term effects of abusing inhalants. Recovery centers for inhalant users typically combine detoxification with psychological therapy. Inhalant users are often teenagers, and family therapy is therefore a common part of the treatment plan for these patients. Aftercare or extended care for inhalant abusers may take place on an outpatient basis after they leave residential facilities. Inpatient treatment: This option is often recommended for those who need more intensive care or who think they will benefit from a structured environment with around-the-clock care. Inpatient or residential rehabilitation generally involves a combination of treatments, such as detox, individual and group therapy, and 12-step groups. A program can last anywhere from a few weeks to several months. Outpatient treatment: Less intensive than inpatient options, outpatient rehab is usually well-suited for those who cannot take time off from work or other responsibilities to attend a residential recovery center. Like inpatient treatment, outpatient recovery usually includes components such as individual counseling, group therapy, and 12-step groups. Participants attend treatment at a recovery center up to several times per week but continue to live at home. 12-step groups: Based on the 12 steps of recovery initially developed by Alcoholics Anonymous, other 12-step groups such as Narcotics Anonymous help people in recovery get and stay clean and sober through attendance at regular meetings and working the 12 steps with a sponsor. Individual counseling: People who have completed treatment at inpatient or outpatient centers often benefit from additional support on their path to recovery. Individual counseling involves working with a qualified therapist, usually on a weekly basis, to address issues that led to addiction. Group therapy: Some people prefer to continue their recovery with the support of others who have been in their shoes. 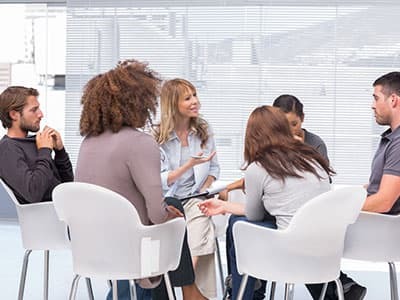 Group therapy is a useful treatment option that generally involves meeting once or twice weekly with a group led by a qualified therapist to discuss problems and to work through life issues. If you or a loved one has suffered from an inhalant overdose or think you might have an addiction, you can start the path to clean and sober living today. Please call 1-888-319-2606 Who Answers? to speak to a treatment support specialist about your recovery options.
. Australian Drug Foundation. (2016). Inhalant facts.
. The Nemours Foundation. (2012). TeensHealth, Inhalants.
. National Institute on Drug Abuse. (2012). Inhalants.
. Alliance for Consumer Education. Inhalant Abuse: Dangers and Effects.
. National Institute on Drug Abuse. (2012). What are the other medical consequences of inhalant abuse?
. Baydala, L. (2010). Inhalant Abuse. Pediatrics and Child Health 15(7): 443-448.
. Alliance for Consumer Education. Inhalant Abuse: Warning Signs of Abuse.